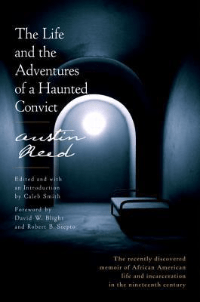 The Life and the Adventures of a Haunted Convict by Austin Reed is the nineteenth-century account of his life as a free, black man born in 1823 who spent his life between hard labor, indentured servitude and incarceration at America’s first industrial prison. The recently discovered manuscript written when Reed was still in prison was authenticated by Yale scholar, Caleb Smith and includes letters written by Reed later in his life. The Life and the Adventures of a Haunted Convict is shocking. It chronicles the life of a black man that was born free in Rochester, New York and started on a self-destructive path early on. Reed was sent to work for a farmer at the age of nine. He was incarcerated for arson in a juvenile facility in New York City from the age of 10 until he was 16. He escaped several times and upon release was sent into indentured servitude. Reed’s memoir was written while he was incarcerated in Auburn State Prison. On his release in 1866, he reformed his life and lived it out in peace. Scholars were unable to track the date of his death, but they located documents that show he was still alive close to the turn of the century. The Life and the Adventures of a Haunted Convict is a fascinating read for anyone interested in history. We know that prisons of the time were barbaric in the treatment of their charges. Reed was treated harshly. He was tortured and abused but also given opportunities to learn a trade and change the path he was on. Reed is not the most elegant of writers, but his tone is very much one of wanting a better life. That he blames others for the situation he’s in is not a cause for sympathy. In his reflective state, Reed often plays the victim and takes the position, much as people do now, if not for these people or environmental influences he could have been quite successful in his life. He is a man that wants to turn his life around each time he’s locked up but finds himself on the wrong path no matter the chances offered to him when he’s released. He has demons that we would now recognize as addictions. There is a poignancy in the idea that Reed did go on to live a free life and presumably defeated his demons on the path that he considered righteous. To be very honest, as interesting as the narrative is, there are some events that seem to be made up for dramatic effects. Reed wrote his memoir during the height of the popularity of Charles Dickens. David Copperfield was released 8 – 9 years before Reed wrote his account and perhaps it’s a coincidence that some of the people that Reed encounters could have been directly lifted from the pages and set in New York. His moralization in the face of the characters is convenient at best. Caleb Smith’s arrangement of the work, as well as the supplementary materials, are appealing and provide closure for the reader after what is often a very difficult to read, a tale of a life lived on the wrong side of the law. At 353 pages, it is a quick read for people acquainted with the language of the day. If you are a stickler for grammar, The Life and the Adventures of a Haunted Convict will bother you. If you are someone that wants a look at a seldom-seen slice of history, pick this one up today.